St. Marys’ Howell stops Clear Fork’s A.J. Blubaugh during Saturday night’s Division IV, Region 14 final in Bellefontaine. St. Marys’ Carson Fishbach, Lukas Walter and Carter Ballweg (1) combine to stop Clear Fork’s Jared Schaefer during Saturday night’s Division IV, Region 14 final in Bellefontaine. BELLEFONTAINE — When Doug Frye returned to St. Marys for his second stint as the head football coach, he knew it was going to be a work in progress. However, after Saturday night’s dominating performance, it appears that Frye’s program is right where he wants it to be. 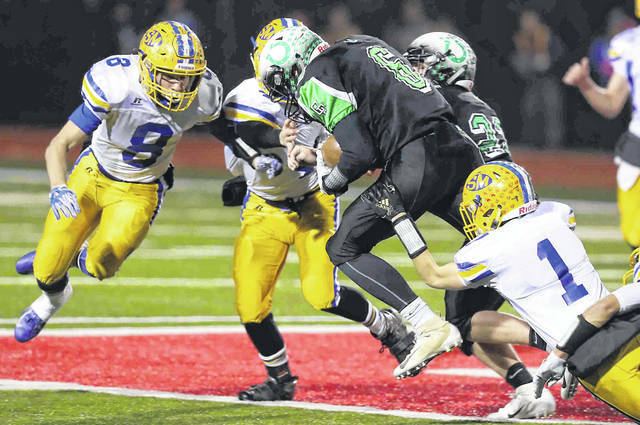 St. Marys took full advantage of a couple early Bellville Clear Fork turnovers Saturday night, and pulled away for a 38-7 victory over the Colts, to win the Division IV, Region 14 championship at Bellefontaine’s AcuSport Stadium. Clear Fork came into Saturday’s regional championship game averaging 43 points per game. However, St. Marys’ defense stymied the Clear Fork offense for most of the game, en route to the lopsided win. With the victory, St. Marys (12-1) returns to the Final Four for the first time since 2004. The Roughriders will play a state semifinal game next Saturday at 7 p.m. against an opponent and at a site to be named later. For the game, St. Marys’ offense rolled up 452 yards (416 rushing, 36 passing). Defensively, the Roughriders held Clear Fork (12-1) to just 193 total yards. St. Marys spread the wealth, offensively. Ty Schlosser led the Roughriders with 138 yards rushing on 14 carries and a TD. Sean Perry rushed for 137 yards on 16 carries and had one rushing TD and one passing score. Ty Howell added 100 yards on 10 touches and had a TD run of 72 yards. The Roughriders wasted little time Saturday night. On the first possession of the game, Howell broke loose for a 72-yard touchdown run. With the point after by Gabe Vandever, St. Marys quickly led 7-0. That scoring drive took just two plays for St. Marys. The seven-point lead for the Roughriders held up to the end of the first quarter as Clear Fork slowed down the potent St. Marys offensive unit the rest of the opening quarter. Clear Fork got on the scoreboard, less than four minutes into the second quarter. The Colts drove 63 yards on 11 plays. Trevon Trammell (13 rushes, 55 yards) capped off the scoring drive with a 7-yard run. With the point after by Gabe Blauser, the game was knotted at 7 apiece. St. Mary’s capitalized on a turnover in the second quarter. After the Roughriders got the football back, less than five minutes left in the first half, Vandever kicked a 30-yard field goal to push the lead to 10-7. The Roughriders were not done. 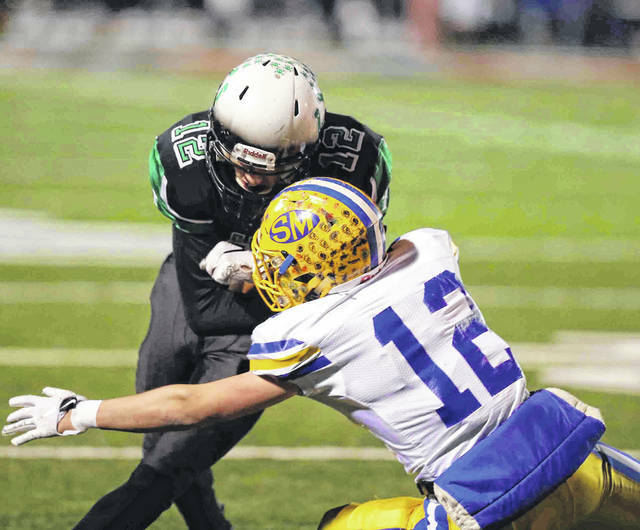 St. Marys took full advantage of yet another Clear Fork fumble on the Colts’ next possession. The Roughriders then traveled 41 yards on eight plays to extend their lead to 17-7. Perry capped off the scoring drive with a 1-yard TD run. The Roughriders went into the halftime break with the 10-point advantage. The Roughriders came out strong in the second half. St. Marys mounted an 11-play, 88-yard scoring drive, capped off with a 16-yard TD pass from quarterback Braeden Dunlap to Perry to push the lead to 24-7 with 4:13 left in the third quarter, which held up to the third stop. Even though it doesn’t happen often, St. Marys got it done once more with its passing game. With a little more than 10 minutes left to play, Dunlap (2 of 3 passing, 36 yards) scrambled and found Howell open for a 20-yard TD pass, pushing the St. Marys’ lead to 31-7, capping off an eight-play, 72-yard scoring drive. St. Marys’ final score was a 9-yard TD run by Schlosser, with a little more than five minutes left to play. There are some ties between Frye and Clear Fork head coach Dave Carroll. “Clear Fork, the community and Dave Carroll (head coach) – they all do a tremendous job,” Frye said “Dave (Carroll) and I have been close friends for many years. He followed me at Danville in the late 80s and we played against each other in the playoffs when he was at Urbana.